“Anatoly Karpov, the twelfth world chess champion, is one of the most successful chess players in the history of the game. The Russian grandmaster was the world champion for a decade, from 1975 to 1985, and he held the No. 1 position on the international chess rating list for 90 months, second only to his archrival, Garry Kasparov. 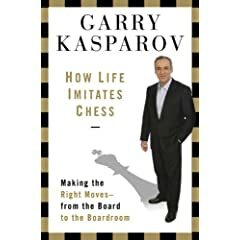 “In his video interview with Big Think, Karpov shares the secret of his success: his fighting spirit, which serves him well not just at the chessboard but in the rest of his life, too. Karpov also reveals his prime weakness as a player—his laziness in studying chess opening-move theory—and how he had to turn that into a strength, by learning to play the inferior positions he sometimes achieved owing to his lack of theoretical knowledge. He also dissects Kasparov’s strengths and flaws, and says that Kasparov can be blinded by fear when his king is in danger. Two former world chess champions were in the news this week, and for reasons that have nothing to do with the royal game. Garry Kasparov was arrested on Saturday in Moscow for leading an anti-Putin rally. He was sentenced to five days in prison and is now confined to “Petrovka 38,” a criminal facility in Moscow. He has not been allowed visitors since his imprisonment and has been prohibited from speaking on the phone. The rally was peaceful. His arrest—only a week before parliamentary elections—was planned in advance by the authorities. “Of course we are very worried,” Kasparov’s wife, Dasha, told the press, “especially after hearing the police at the court say they had been ordered in advance to arrest Garry specifically. Who knows what they have planned for him? And why can’t we visit him? We are asking everyone to get this story out and to let Putin know that the world is watching and that he will be responsible if any further harm comes to Garry.” The Web site of Other Russia, the pro-democracy movement that Kasparov leads, will have updates on his situation as news becomes available. The word is out that Bobby Fischer, the pride and embarrassment of American chess, has been hospitalized in Iceland for kidney and perhaps mental problems. The details in the press and blogosphere are frustratingly scarce. Mig Greengard’s Daily Dirt gives the best summary of what’s known about Fischer’s condition. I am of course familiar with the stereotype of the chess player as madman. And in King’s Gambit I portray individual chess games as passionate, operatic encounters. When Garry Kasparov retired from chess to go into Russian politics and oppose Vladimir Putin’s turning away from democracy and a free market economy, Kasparov’s family and friends feared for his safety. Indeed, in the subsequent months, Kasparov was bashed over the head with a chessboard, detained by the authorities, and his associates were beat up and arrested–apparent warning shots from Moscow to show him that they could squash him at any moment of their choosing. And yet the chess community is divided on the issue of his safety. Vladimir Kramnik, Kasparov’s younger countryman who displaced him as world champion, believes that the older, outspoken Russian has nothing to fear from the Kremlin. He told the British magazine Chess (in an article called “When Lev met Vlad,” issue No. 4, 2007) that he didn’t believe that Kasparov’s life was in danger and that Russia was not the totalitarian state portrayed in Kasparov’s interviews in the West. Vladimir Kramnik, the reigning world chess champion, celebrated his thirty-second birthday yesterday by doing, in his own words, something “unfortunately pretty boring”–preparing for today’s opponent in the elite Dortmund tournament. When Kramnik, whose play has sometimes been described, perhaps unfairly, as “unfortunately pretty boring,” defended his crown last year, he earned the sympathy of fellow chess pros and fans when he was forced to explain his hydration and evacuation habits after challenger Veselin Topalov exaggerated the number of times (50!, he said) that “Krapnik” had visited the bathroom (Topalov was insinuating that the world champion was cheating on the toilet by consulting chess-playing software). Kramnik managed to win the match despite Topalov’s assault on his dignity and bladder. Dortmund is the last tournament in which Kramnik will participate before September’s world championship in Mexico City. This weekend, FIDE, the world chess federation, released a byzantine set of rules on who will be playing whom in world-tile matches after Mexico City. When asked on his birthday about what he thought of the new labyrinthine rules, Kramnik said he’d need to study them in order to understand them! “I think there are more people who don’t understand the system than who understand,” Kramnik remarked. “I don’t know if the people who have invented it fully understand the system but it seems to be very complicated.” And this coming from a man who has mastered the intricacies of the Semi-Slav Variation and other esoteric chess openings. Pity us mere mortals who try to make sense of the new rules for world-championship succession. Fortunately, chessbase and chessninja have taken a stab at deciphering the rules for us.